The official Spectrum Miami 2018 show schedule has been posted below. Explore the official Spectrum Miami 2018 show schedule, and get excited for next year’s show! You are the first on the scene! Preview and purchase the artwork on display, enjoy Louis Jadot wines and hors d’oeuvres, groove to the hottest tracks from New York’s DJ Keith Butler—and find the perfect piece to add to your collection! Step into the spotlight, and create a memory you’ll never forget. Take your picture in front of the Spectrum Miami backdrop. Coming straight from Art San Diego, Max Daily, one of the 2018 San Diego Art Prize’s winning recipients, brings his most recent creation, the Oslo Sardine Bar, to Spectrum Miami 2018. Step inside, the proprietor is charming, amusing, and quite talented. It’s an experience to be remembered! Look for the Spectrum Miami Selects Awards throughout the show. The Spectrum Miami Selects prestigious panel of judges will make their favorite artwork choices on Wednesday, December 5, at the Opening Night Preview Party! Are their winning choices your favorites too? Walk the show to find each one. Get a focused look at this year’s specially curated group of Spotlight Program recipients: Artblend (Booths 105 & 108), Doug Powell Art (Booth 331), Marianne Enhorning Design (Booth 502), Mecenavie Gallery (Booth 100), and Tracy Piper Studio (Booth 634). It’s pop art reinvented! Meet Jeffrey Bisaillon, a self-taught artist who creates what he calls “uber-contemporary” pieces. Using organic curves and clean, modern lines, the perfect union of art and design come together in his works. Always pushing the envelope to use the newest materials, incorporating design trends and cultural influences, Bisaillon continues to evolve and surprise with his works’ simplicity and collectibility. Most fine art pieces have a story behind them; a narrative that not only explains what’s being depicted or expressed, but also gives insight into its inspiration. It’s been said that all art starts in the mind of its creator. And each piece that contemporary American sculptor Eric Shupe creates has multiple stories behind it—chiefly due to the unique media he sculpts in. Come meet this passionate artist, take a second look or two, and be amazed at what you see! Watch as Marianne creates her next female inspired work of art. Born in Sweden, she is deeply influenced by her family heritage. Marianne’s figurative work is a tribute to the indomitable power of women. Her life size figures celebrate inner strength and personal power. Despite the many challenges faced by women culturally and historically, they rise above, using love, wisdom, and the sisterhood to prevail against all odds. Which one will be part of your collection? Persian artist, Souren Mousavi, has dealt with trauma, tragedy, and upheaval due to her early life in Persia (now Iran), fall of which heavily influence her art. Her latest series focuses on figurative influences and capitalizes on her use of ink and watercolors as mixed media. She hopes each painting will seize your imagination — come watch as she creates and be captivated by this amazing, gifted artist. Come meet Eleazar, a Spanish artist that uses critical satire and humor to reflect on social issues and cultural myths with irony and irreverence. Learn why his work was censored in Malaga, why he is nonetheless continually invited to exhibit at provincial city halls, and why we should all find humor in Spanish society, traditions, and politics. Employing a mix of collage, Basquiat-like characters, strokes akin to street graffiti, the art brut of Dubuffet and the African masks of Picasso, he invites you to participate in the lively scene. Which one will be your favorite? Jennifer Ardolino sees art in many things and has a magical way of transforming what she sees into vivid, wonderfully colored images that transport the viewer into the scenes. The rich palette of the tropics and the beauty of nature have provided Jennifer with an endless variety of vibrant subjects. Her chosen media extend from the supple natural beauty of watercolors to the strong vivid colors of acrylics. Come visit with her, you’ll be transfixed with the work. Which one belongs in your collection? Chad Daly, young South African artist, who’s unique art uses a material that is commonly present in our everyday life but quite unheard of as an artistic medium: banknotes. Already passionate about money, its fluxes, exchanges, and the sheer esthetics of a bill, he decided to go all out on this idea by directly creating art with currency. Somewhere between sculpture and origami, his art features skulls, animals, geometrical shapes depending on the series and themes he chooses. Come check out the art from cash! Grégoire Devin is a French artist who started drawing at a young age. Very influenced by street art, Devin got trained in some of the most dynamic cities of the world. In his pieces, the artist incorporates his interactions with the urban culture, drawing his inspiration from the energy of pop art and from counterculture movements present in New York. Meet Gergoire and learn more about his inspirations and work. Meet award winning artist Christine Alfery. About her art, she says, “I create art like I make chocolate chip cookies neither is made the same way twice.” As her style has evolved through the years, each fresh expression has been greeted with enthusiasm and demand. Christine’s artistic style shows a maturity that comes from her lifetime of creative exploration. Join her to learn more about her artistic explorations and explore her current collection. Stan Adard creates “breathing pictures.” He is very clear about his art and the reasons and message behind it. He states, “Breathing is life. Every single cell in our body needs oxygen to produce energy. Exhaling transports toxins and waste products out of our body. There exists a strong connection between breathing and mental states. The breathing pictures put a contrast to the hectic world of images around. The paintings radiate grace, beauty and tranquility. An invitation to relax, to breathe and to inner contemplation.” Come enjoy the sweet breath of Stan’s work. You are going to fall in love—maybe with Yenny and her approach to her art, but definitely with her sculptures! She says: “My artistic expression and challenge is to refine the human figure to basic and almost geometric forms. I love to use simple body postures and language to portray an emotional idea or story. My romantic couples express all the romantic or loving longings with their unique body language.” Stop by, say hello, and…fall in love! Alex explains about her work: “What happens with my artworks, happens with my life. When I paint, I get free from ‘what has to be’ and try hard to show ‘what I think it really is’. I try new things, break conventions, try different agents and chemical reactions with acrylics. I look for equilibrium, contrasts, patterns, movement. I want to explore and in doing so I discover a hundred possibilities.” What do you discover in her work? While Christian Bakker is a successful businessman, he has always been an artist at heart. His art studies in both Ecuador and in the USA at The Art Students League and the MOMA Museum of New York, has provided him with mastery of different techniques, allowing him to portray multiple aesthetic designs with shapes that take us to spaces full of metaphors and movements. His paintings can speak for themselves, and they can also express a captivating inner faith. Stop by, meet Christian, and explore his inspiring works with him. Who knows—maybe one belongs in your collection! Myriam Sitbon is a painter and sculptor originally from Morocco, who was born in 1957 in Casablanca. Since an early age she was passionate about artistic creation, encouraged in this field by her professors. She creates graceful pieces, with dancing and stretched curves. Women and dance are two recurrent subjects in her work, both are done in bronze sculptures in bronze reflecting the technique of the artist. Meet Myriam and catch the spirit of her work. Daniel René is the inventor of the end-timber technique in France. In 1985, Daniel René invented the so-called “end-wood” technique. It is not about painting, sculpture, or markers. It is a technique in its own right that adheres to support pieces of natural end wood (not machined) of different shapes, sizes and thicknesses, sometimes dipped in polyester resin inclusion. It is a difficult and very long technique to implement. Badly rendered by photography, these paintings must really be seen to discover all the riches. Come Meet Daniel and see them for yourself! Take a look—then take a second look! You’ll be surprised by the materials and awed by Roy Shapiro’s ability to combine elements of steampunk, Goth, and contemporary style, into his sculptures. Working with varied textures for over 35 years, turning everyday materials into works of art, Shapiro will delight you with his story. Meet Shapiro, watch him at work, and see how the human body, affairs of the heart, and the power of metal all combine into a work of art. Meet Mr. Hikkuri, the alias of an unidentified visionary artist, originally from Mexico City. The artist has worked in the urban environments in Mexico, the US and Europe, using varied materials to subversively depict various iconic pop and contemporary culture characters and designs. Stop by and check it all out and see how Hikkuri Casa is reinventing a wholly modern approach to art, design & casa. Enjoy the hottest tracks from New York’s DJ Keith Butler while experiencing the excitement of Spectrum Miami’s amazing art and events. Majie Lavergne is an award winning French abstract painter. His father, Robert Lavergne, a well-recognized post-impressionist painter, fostered his love for painting at an early age. Following his career as a documentary filmmaker, Majie turned back towards painting and now dedicates his time to creating art. 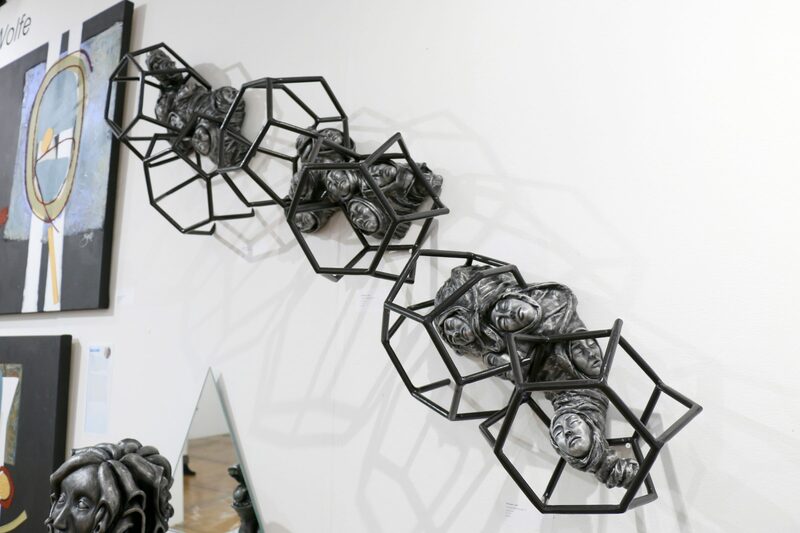 His collection RE-CREATE challenges the traditional boundary between “artist” and “audience,”inviting the viewer to create their own composition by physically moving various shapes on a magnetized background. Meet Majie and re-create your own piece of his art. Meet veteran artist Charles Sucsan. You’ll understand immediately the appreciation he has for your interest. He states: “For me as an artist in visual art, expressing in material different thoughts on beauty or any other subject, it is the way of life. Of course, any creation coming out of the mind will live only if it is shared with others, therefore, showing and exhibiting the artist work is a must.” He’s looking forward to meeting you! The story of Gideon Nyanhongo is about personal challenges and the emotions he transfers into his work. Gedion is an original artist – the reference and sensitivity of his art makes that very clear. His vision and technical skills have earned him international recognition. Nyanhongo celebrates love, especially family love and the spiritual power it provides to promote peace in his art. Stop by and meet this engaging man. Join Laura Bruney from the Arts & Business Council of Miami, learn about the Miami Loves Arts project. The Arts & Business Council empowers Miami’s creative ecosystem working over 1,000 artists and arts organizations. Show your love for the arts at our instagram ready activation. Take a photo at Miami heart Arts with the 5′ foot heart, heart props and heart pops. Part entertainment, part educational,—be sure to pick up information focused on how you can personally engage in the arts. Meet Tracy Piper, an ex-circus performer turned figurative painter. Her “You Are Loved” series of portraits emphasizes the uniqueness inherent in us all. Fabricated from multiple sources, these fictionalized “daughters” challenge society’s notions of beauty by finding empowerment in their individuality. Seemingly familiar, these portraits could be of someone you know—neighbor, friend, sister, child, me, or you. “In this oversaturated world where we are told how to look and behave, these portraits are a reminder that you can simply be you. You are enough. You are worthy. You are loved,” she says. Come feel the love! Internationally recognized artist, Ignacio Corral, explains his work very succinctly: “I feel that my painting, as a form of expression, is capable of breaking the monotony of the flat plane and allows the viewer to actually enter the piece. My works do not copy any other reality—they are real, and, as such, serve as a perfect counterpoint to our current reality.” Meet Ignacio and explore the importance of his work. Meet a dynamic painting duo—Gasque (father) and Jasso (son)—two dedicated abstracts artists who shine for their contemporary abstract techniques. inspired by the masters in art history: Picasso, Miro, Dali, Jose Luis Cuevas and Van Gogh, they also inspire each other. Come meet this duo—is there one of their works that’s perfect for your collection? The New York Film Academy (NYFA) is designed for a new generation of storytellers: visual and performing artists who share a driving passion and want to learn by doing, creating their own projects in a hands-on, intensive environment. Through the highest quality project-based learning, NYFA students experience how all aspects of their chosen craft relate to, interact with, and depend upon each other. NYFA welcomes students from diverse backgrounds — from over 120 countries and all walks of life. This nurtures a supportive, positive atmosphere conducive to the the level of collaboration necessary to create great work. Stop by and see the artwork from 10 artists whose magic behind and after the camera are evident at first glance. Jennifer Pazienza has spent a lifetime getting to her art. Always a painter, but also engaged in teaching and other pursuits, it is only recently that she has become a full time painter. And she’s loving it! Whether you see her work as a landscape or abstract expressionism, you will definitely be intrigued. Stop by and chat a while and see how she interprets the world around her. Meet Bulgarian artist D’Neycho and learn how he knew from an early age that his destiny was art, despite being from a military family. Perhaps the discipline of his early upbringing gave him the determination and drive to pursue art and find his own distinctive style. With a career rich in the arts as both a curator and an artist, he brings a vitality to his work. Artist Roxy Sora arrived in Florida from Cuba when she was just 8 years old through the Pedro Pan mission that brought more than 14,000 children to the U.S. ahead of their parents. When her parents did arrive and they were reunited, she started honing her love for art. In her art, you’ll learn what a human vision can create. Your eyes will get lost in colors in the strokes of a brush. Aaron Schwartz has been involved in Florida’s film and television industry for over 20 years. It’s safe to say Aaron has seen most of Miami from more angles than just about anyone. No surprise that his art is mastery of an innovative technique, best described as ink painting on photography. Come see how his combination of ink, sharpie markers, photographic prints, and chemical solvents that dissolve the photo emulsion to create a unique new art form. Husband and wife team, Frank and Christine Malvasio, combine their creativity and together have fashioned an elegant line of masterpieces. Frank, born in Germany, and of Italian-German descent, was afforded exposure to famed artists’ works, grand architecture and European history in his early years. After coming to the United States, he continued to pursue his interests in the arts and design. Christine possessed a natural gift for design and was inspired at a young age to start her own jewelry line. She incorporated organic rocks and crystals into her designs which has now inspired much of the art they create today. Meet these two dynamic artists and discover the symbolic meaning of their designs with the incorporation of rare, natural geodes, faceted crystals and created embellishments. Columbian artist, Masare, is an architect by profession and specialist in multimedia design. Also a musician and an artist in permanent research process of materials, techniques, design and audiovisual creation, he merges all his expertise into his mixed media works. Meet Masare and be captivated by the reflection, refractions, and messages of each piece. Camilo Pinto brings a joy of life into his exploration of drawing, painting, and mixed media where the feminine gender emerges as an icon of sensuality, a sacred and aesthetic object. Visit with this artist and learn about his explorations, inspirations, and newest collection. As a child, Patricia Vesga expressed interest in figurative drawing, painting everything she saw. Her favorite subjects are portraits and the human figure. Today, as both a teacher and artist, she explores the theme of self-portrait and experiments with materials. A woman dedicated to art, she brings a touch of color to all her work. What color is your favorite? Walter Zuluaga is a contemporary realistic artist, sometimes Surrealist, whose primary subjects are animals. His ability to create them in vivid colors makes them impressive and memorable. With his sense of humor speaking through his images, you’ll enjoy meet him and the conversation. Maria Elena Beneito is a professor, art critic, and the editor of the Argentinean Art Yearbook. President of the International Association of Plastic Artists (AIAP) of UNESCO, an Argentine subsidiary, and vice president of World Art Games, an Argentine subsidiary, Beneito develops work about art without borders, opening markets and positioning Argentine artists inside and outside the country—and is simply a fascinating woman. 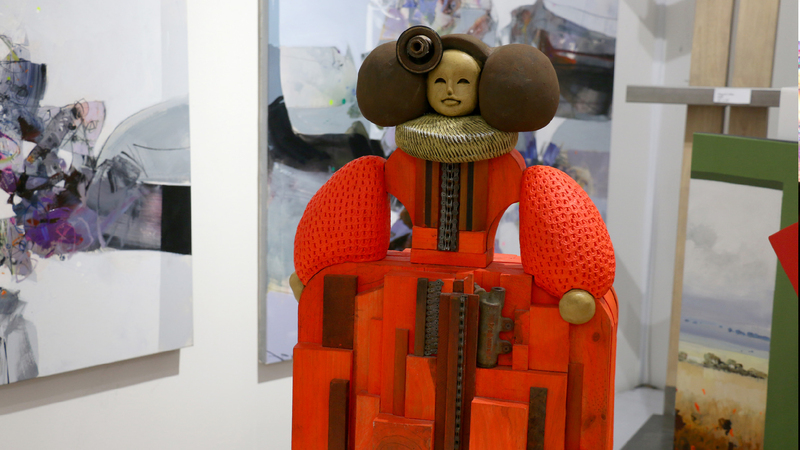 Join her as she tours the Maria Elena Beneito Gallery exhibition. Come meet Amazone and learn about her creative inspirations and see how her work as a tattoo artist have influenced her installation. Her innovation and imagination are the sparks that make her works original and interesting. Carla Garzon is inspired by her deep Colombian cultural heritage. Her passion is expressed through bright positive colors that symbolize happiness and positive energy. Paint, textures, color are all the symbols and meaning she employs in each of her pieces. Meet Carla and enjoy her wonderful, colorful world! Meet artist Paula Quintero, see her works, and enjoy the exploration of her story. Lukas Mora began studying art at an early age with a clear talent for visual arts. His style and expression have matured into realism, interpretive realism, portraiture, and pop culture. Influenced by music, Lukas’ depicts classic, iconic stars in his modern stencil style. You can almost hear the music in his realistic interpretations of these iconic stars. Odilis Mezquia will captivate you with her story and the evolution of her work. Walk with her on her journey and see her most recent works. 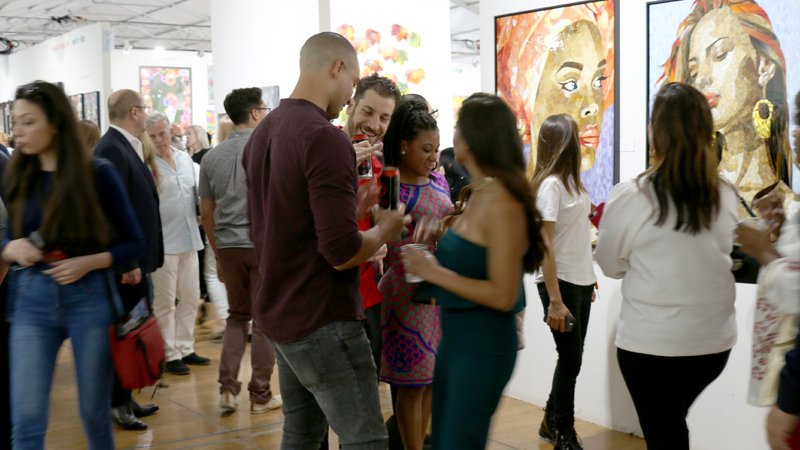 Just getting your weekend at Miami Art Week started? Kick it off in style at Spectrum Miami! Enjoy a glass of Louis Jadot wine, stop by and see the fabulous art at the Artblend exhibits, and take in the sights of the show. JC Cepeda is a painter, sculptor and poet. His expertise, versatility, and mastery of multiple artistic endeavors is engaging from first glance. Meet this dynamic Spanish artist and be captivated by the intensity of his colorful expression, not to mention his stories, his journey, and his achievements. Meet Monica Garzon Palacio, see her works, and enjoy the exploration of her story. Frinee Rodriguez Gautreau—or you can just call her Frinee—is a painter that creates lyrical compositions on canvas. Is it a skyline? Not exactly. is it an expressionist work? Not exactly. Come see for yourself and make your own conclusion. Tony Castillo sees the world through art, and to better understand this infinite medium of expression. He is always exploring new mediums of art, even clay paintings and sculpture works. And so his multimedia Board’Ems were created where fun, handmade art pieces for everyone could be created and enjoyed. Meet Tony and enjoy his creations! Roman Gonzalez grew up in a family steeped in their appreciation for culture and the arts. A fan of twentieth-century art, he feels great sympathy for artists such as Basquiat, Pollock, Calder and Koons. Meet the artist, see the genuine spontaneity and diversity of themes in his work, and feel the sarcastic attitude towards current issues. Don’t miss Young Collectors’ Night, the must-do, exciting, high-energy evening for new collectors, emerging philanthropists, and art enthusiasts. 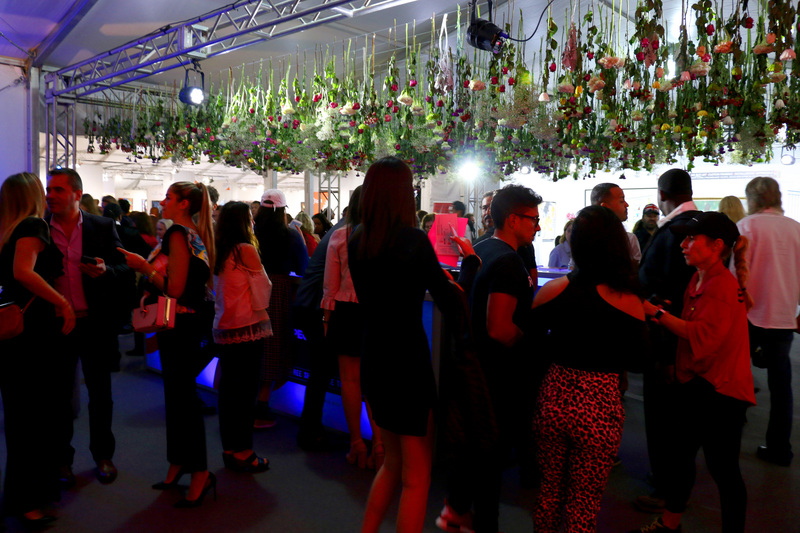 Enjoy Louis Jadot wines, tap your toes to the tunes of New York’s DJ Keith Butler, watch live art demonstrations, meet curators who will share art insiders stories, and take in all the action that’s buzzing at Spectrum Miami 2018. Architect and contemporary visual artist, Ricardo De la Torre is as passionate about his career as he is a lover of the arts. Seeing the different views and color of nature at an early age woke up Ricardo’s vocation for drawing and painting. With work that continues to evolve, take this opportunity to meet this interesting artist and see his work and the authenticity that defines him. Tickets for 2019 are now available! This year’s programs will feature the anticipated return of Art Labs, LaunchPad and Spotlight programs, and Art Talks, featuring wide array of modern, contemporary, and cutting-edge art.